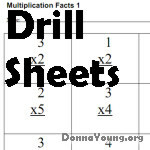 This page contains a variety of printable multiplication charts. Also included are multiplication charts with missing products and a multiplication practice set. 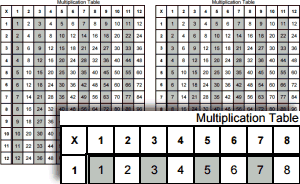 This group of three files contain a varying number of black and white filled multiplication charts; there are no gray columns in this group. There are three layout choices in this style. 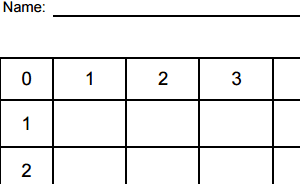 The top two files have two multiplication tables, one with wide tables and one with narrow tables. The bottom file called 'tiny' has four small multiplication tables. The image above shows a reduced image of the wide tables. This group of files is like the group above, except this group has gray columns to help the child track the numbers. This file prints a horizontal blank multiplication table. There are two - one up to 10 and one up to 12 (pictured). 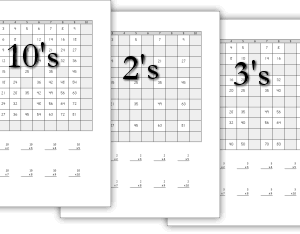 The two printable mulitiplication charts here are my older large charts. One is in color and one is not. At Math Paper- Papers Designed for Math Work from a Text Book, you will find printable papers that I made for children who work from a textbook. The math papers have various qualities - graphs, multiplication tables, number lines, blocks, number writing practice, and blue ruled lines. These qualities do not exist on every single file; each file has its own qualities. The files that I am pointing you to here are the papers that have a multiplication table printed all around the border. These particular papers have blocks in which the student does his work. They are the first printable math work papers featured on the Math Paper page at donnayoung.org. 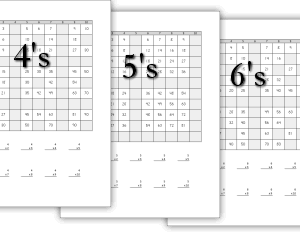 I created this paper with the multiplication table for those children who are in the progress of memorizing the math facts. 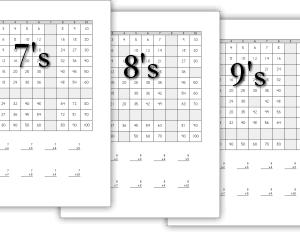 In addition to this paper, or instead of using this paper, provide your children with a multiplication table chart while they do their math work. Black out or cover with stickers (if your children likes them) the parts of the multiplication table chart that they have memorized. In the section of Math called Math Facts you will find 3 different types of flash cards - square, and two styles of triangular cards. 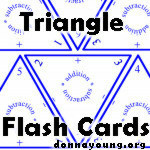 I recommend the blue triangular flash cards that are pictured here, you can print them from Blue Triangular Math Facts Cards. There is also a black and white version of these cards at Black and White - Triangular Math Facts Cards. In addition to using flash cards, or instead of using them, practice math facts orally in different ways. My children like walk quickly ( almost a trot ) around the table while reciting the multiplication table and on other days, they liked standing in a chair and saying the multiplication tables as loudly as they wanted. I'm pretty sure they said them while doing jumping jacks too. 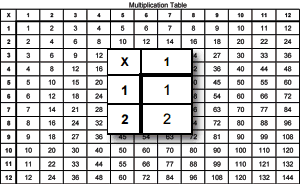 Either way, encourage (and give opportunity to) your children to learn the multiplication table - this in one of those often snubbed "rote memorizations" that should not be ignored. Trust me. The same applies for addition facts.